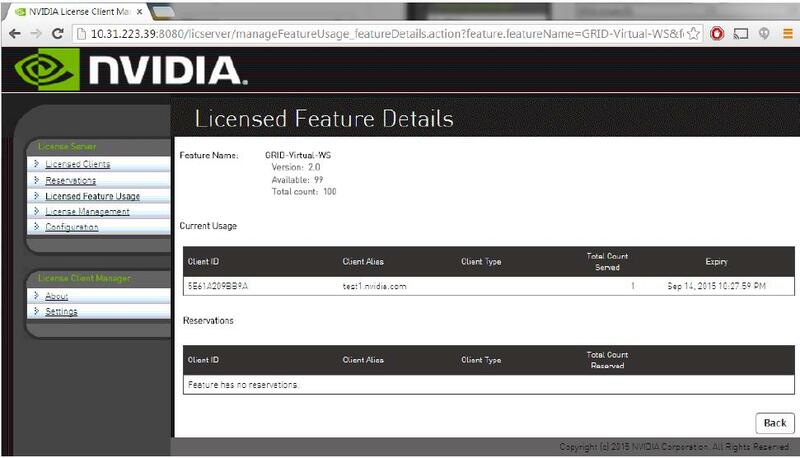 Select "Licensed Features" from the left hand side panel in the management interface. You will see a list of all the licensed GRID editions currently deployed. "Count" indicates the total number of licenses for each edition that are currently deployed. "Available" indicates the licenses available to use at any given time. This number goes down as GRID enabled VMs check out licenses from the server. When availability drops to zero, it means the usage is at peak capacity. You can also view when the right to use a term-based license ends under the "Expiry" column. For a perpetual license, this field will be marked 'permanent'. You can select any license type from this list to find out details of all the clients that are currently using this license. To view all the clients that are currently using GRID licenses, select "Licensed Clients" from the left hand side panel. You can select individual clients from the list to view further details about them.